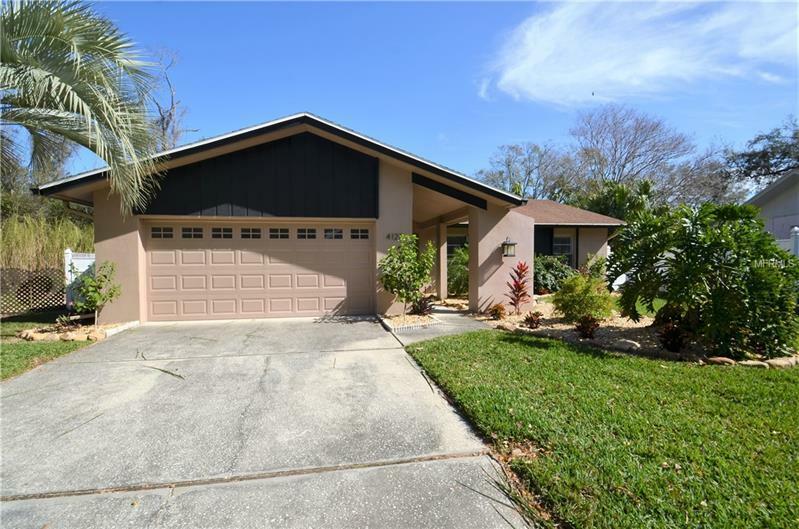 Check out this lovely 3 bedroom, 2 bathroom, 2 car garage pool home located on a quiet cul-de-sac in the charming town of Safety Harbor! When you enter this home through the glass leaded front doors, you will immediately notice the spacious living room and soaring vaulted ceilings, with lots of natural light! There is new vinyl flooring throughout, and pocketing sliding doors too. Let's get cooking in this beautifully remodeled (12x21) kitchen featuring wood cabinets, granite counter tops, and new stainless steel refrigerator. There is plenty of counter space and storage! The kitchen also has a breakfast bar and (7x12) eat-in kitchen space that overlooks the patio and pool area. Off of the kitchen is the (13x17) dining room which has vaulted ceilings and pocket style doors. Enjoy a good nights sleep in this large (13x15) master bedroom with en-suite bathroom that has been completely remodeled; newly tiled floors and walls, new vanity with vessel sink and all new fixtures! There is direct patio/pool access from the master bedroom through the glass sliders. The guest bathroom was also fully remodeled with new tile flooring, tiled shower, seamless glass sliding doors, and new vanity. Entertaining should be a breeze on the (27x38) covered & enclosed patio area with lagoon-shaped swimming pool! As a bonus there is two dual doggy doors! This home is conveniently located with in minutes from schools, hospitals, parks, beaches, shopping, restaurants and so much more... This home won't last long!